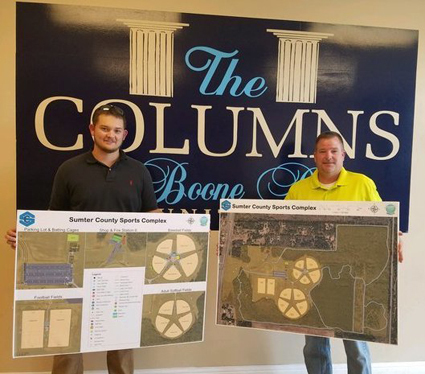 Prior to interning with Sumter County’s Human Resources Department, Geology major, Andrew May, was not very familiar with the operations of county government at all. However, throughout his internship, May learned immensely about the operations of county government and how closely all aspects of county government must work and depend on one another for success. During the course of his internship, May was responsible for assisting the Mapping Department in any way that they requested, which ultimately culminated in him working to map and document all of the features of the Sumter County Sports Complex and creating a database of information pertaining to that area. May credits this experience as his most significant success during his internship, noting that it was important and beneficial, in that, he was able to create these maps, recognizing their potential uses in the future. For May, the best part of the internship experience was the hands-on learning opportunity that he gained with the ArcGIS software. May also thoroughly enjoyed working with the excellent people of the Mapping Department and having the opportunity to complete a project that would be beneficial to the community. Ultimately, May greatly advanced his skills with the ArcGIS software, Pathfinder Software, and Trimble GPS units, knowledge that will strongly benefit him in his future as a geologist. To future interns, May advises them "to not be afraid to ask questions, work hard, [and] don’t complain." When asked if there was a career in county government for May in the future, he answered that there wasn’t at this time, as he plans on completing a Master’s program. However, he is open to the prospects of working in county government in the long run.